SIBOLA ELECTRIC is a company that offers services whether building or maintaining in the electrical trade that meets and exceeds all industry standards. Our services integrate and optimize very competitive pricing with safe and efficient work that continually meets the dead line to ensure it is in line with business goals. Our mission is to deliver unremarkable service at an exceptional value. As technology and the electrical trade grow so will we with our valued customers and our dedication to safety. It is our goal to grow our business with long lasting client relationships. SIBOLA Electric is a full service electrical contractor servicing the industrial, commercial and residential sectors. Our head office is located in Prince George British Columbia but our Service area has no limit. We provide a wide range of expertise and services that is constantly growing with technology that keeps us in focus to be dedicated to meeting and exceeding our customers needs and satisfaction. We offer services in new construction, modifications and upgrades, maintenance shift coverage, lighting upgrades, thermographic equipment scans, project management, design, controls and automation. We strive to be the best and give the best possible experience and workmanship. 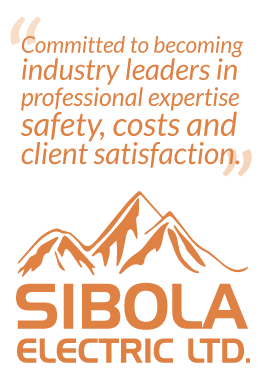 Grow your career with Sibola Electric. Join our team of professionals in a technical and rewarding industry.